It’s summertime and the living should be easy, right? Fruits of all varieties are in delicious abundance, and are begging to be baked into a pie. I don’t know about you, but my first thought about pie baking is “pain in the neck” – not “easy”. Plus, your standard pie only serves six or eight. Well, my friends, I have discovered the solution – easy to make and easy to serve. It’s the Slab Pie! You slice into squares instead of those messy triangles, and this recipe serves a crowd. It is also really easy to transport if you are responsible for taking dessert! Your most difficult decision is what type of fruit to use. Not bad, huh? I bought some gorgeous blueberries for a great price, so my decision was easy. You can easily substitute other berries, sliced peaches or nectarines, or nice ripe plums. The first step is the crust – super easy if you use a food processor! The key to this tender, flaky crust is using cold butter. I like to freeze mine, cut in small cubes, and refrigerate until the minute I add it in. Using ice cold water is important, too! Don’t over mix – it will make it tough. Pulse just until it comes together, then squeeze some between your fingers to see if it will stick together. Chilling the dough before rolling it out also allows the gluten to relax, making a more tender crust. Roll the first crust into a large rectangle, and carefully ease it into the pan. Note that this is a 10 X 15 pan, not a half sheet baking pan! 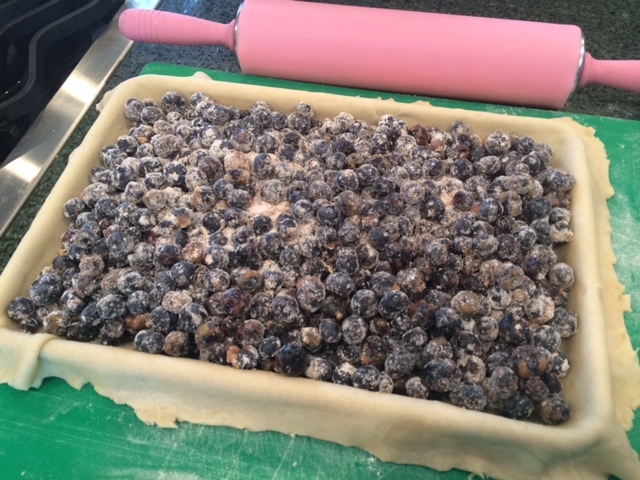 After stirring the dry ingredients together, and gently stirring in the blueberries, pour the mixture into the crust-lined pan and spread to an even layer. Trim the edges of the crust – kitchen scissors come in handy for this task! Top with the second crust; flute to seal edges. Cut in a few slits to let steam escape. Brush the top with some cream, and sprinkle with granulated sugar, or sparkling sugar if you have it! Put it into the preheated oven; reduce the temperature, and bake to golden and bubbly perfection. Let cool a couple of hours before serving for ease of slicing. To prepare the crust: If you do not have a large-capacity food processor, process the crust in two batches. In the processor, pulse the flour, salt and sugar together to evenly distribute the ingredients. Add the cold butter, and pulse until the mixture looks like oatmeal. With the machine running, add 1 cup ice water. Pulse until the dough is crumbly. If it does not hold together when it is squeezed, add a bit more water, a tablespoon at a time. Divide the dough in half. Press each half into a flat disk, wrap in plastic, and chill at least 1 hour. Preheat oven to 400°. On a lightly floured board roll one pastry disk into a 12 X 16 rectangle. Carefully place into a 10 X 15 jellyroll pan. Pour in filling (see instructions below) and top with the second pastry disk, rolled to a 11 X 15 rectangle. 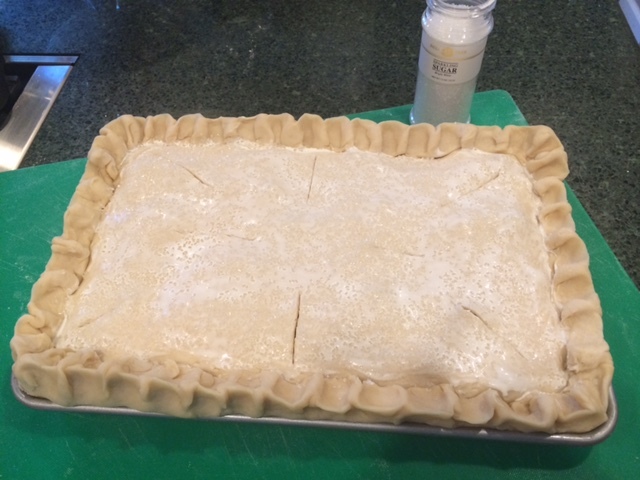 Seal and crimp pastry edges together and cut several slits in the top to let the filling vent. Brush the top with cream and sprinkle with sparkling sugar. Place the pan in the oven and immediately reduce the oven temperature to 375°. 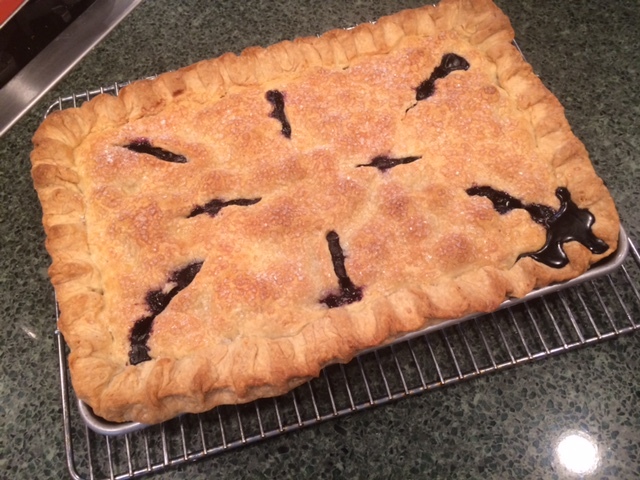 I recommend placing a large baking sheet on the rack below the pie just in case it should bubble over! Bake for 50-60 minutes until pastry is golden and filling is bubbling. Remove from oven and let cool 2 hours before serving. To prepare the filling: In a large bowl stir together the cornstarch, flour, sugar, and cinnamon to evenly distribute. Add the blueberries and carefully stir to combine. Pour this filling over the crust in the pan. Top with remaining crust, and proceed as directed above.